February 13, 2018 - "Press Releases"
Specifying a chiller for a given application requires understanding the process to be cooled and its temperature stability demands. Many processes can be adequately supported with ±3°F temperature precision. Others benefit from more precise temperature control. Increased precision often comes at an added cost, so determining whether the process can benefit from such precision should be considered. Balancing cost and temperature stability leads to a lower total cost of ownership (TCO) and improved reliability for the end user. As industrial processes and equipment have advanced to support higher productivity in small packages with increased thermal density, chiller designs also have evolved to meet the demand for reduced variation in fluid temperatures, especially in more complex and sensitive applications. In some processes, performance advantages are enabled by more precise temperature control. MRI, laser and semiconductor equipment are examples in which technological advances require close regulation of process temperature. Such close regulation is enabled by appropriately featured chillers. In MRI equipment, tight temperature control helps to produce higher resolution scans. 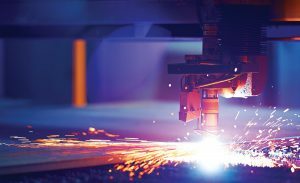 Lasers are another example that benefit from close temperature control to deliver consistent results. In each of these applications and many others, precise temperature stability is required to achieve optimal results. Read the entire article “Chiller Designs Support Process Uptime” in Process Cooling Magazine.